Click the plus signs to allow each day’s schedule to drop down. Simon Reilly—“Clear Your Roadblocks” — Every financial advisor knows that they “should” invest in strategies that include business planning, delegation, time management and asking for referrals but they are sabotaged by roadblocks that prevent these strategies from being a “must”. Lean what the roadblocks are and how you canis that they fail to plan for it. Joe Jordan — As one of the most recognized names in the industry, Joe Jordan passionately believes that financial services is the noblest profession in the world. His message inspires financial services experts to become modern-day heroes, motivating financial experts to reaffirm their purpose. Lakitsia Gaines – Learn the qualities it takes to be successful! Kitsia’s inspirational message will motivate you to change your attitude and outlook about yourself and your career. A State Farm agent from South Florida and MDRT qualifier, she has worked in her community promoting financial literacy and has appeared on the “Steve Harvey Morning Show” discussing financial matters. Cliff Karthauser , CLU, ChFC, CLF– We are all faced with challenges and obstacles that can become defining moments that help move us forward rather than set limitations. From Lincoln, NE, Cliff was with Principal Financial Group for 35 years and is a former world class distance runner. He will challenge you to reflect on your own journey with passion and purpose. Bryan Hughes, BBA — With NML in Miami, Bryan has numerous company and national awards and honors for his production. He built his very successful business by learning Russian and serving in that market. Bryan sits on the Board for Russian Connections, an organization to foster the growth of Russian-owned businesses. Hear his amazing story of creating an extremely productive niche market! Simon Reilly—“7 Actions to Take Now to Meet and Exceed Your Goals” You know you want to grow your business and earn more money but don’t know where to start! Planning is a critical part of business growth. One of the biggest reasons that people fail to realize success is that they fail to plan for it. Diane R. Boyle, HIA- Diane is NAIFA Sr. VP of Government Relations and is NAIFA’s chief federal lobbyist. You’ll hear the latest updates regarding issues in Congress and the White House which impact insurance and financial advisors. Diane’s expertise and knowledge about the happenings in Washington are fascinating! Paul Dougherty, LUTCF, FSS, HIA—Paul is the 2016-17 NAIFA President and a State Farm agent in Hyattsville, Maryland. He is the past president of NAIFA-Maryland, and served as the chair of the Coalition for Retirement Savings in Maryland, which includes the American Council of Life Insurers and Securities Industry and Financial Markets Association. Terri Seefeldt, RHU — “Health Industry Update for 2017” – Terri provides an update to health insurance advisors on the latest industry changes. Whether it’s in Washington or Tallahassee, legislators are very busy these days dealing with health insurance issues. For a quick overview of the industry, Terri’s class will be extremely helpful! Noon – 2:15 p.m. Awards/LILI Graduation Luncheon- Guest tickets are available for pre-purchase ($50) for the luncheon only. Tim Meenan- Hear about new laws impacting YOUR business from NAIFA-Florida Lobbyist Tim Meenan! Protecting financial advisors from harmful legislation keeps you in business. Get the latest from the Capitol in Tallahassee! 7:15 – 9:15 p.m. President’s Banquet- Guest tickets are available for pre-purchase ($85) for the President’s Reception and Banquet! Note: The Rosen Centre Hotel is full Wednesday thru Friday nights. There is still some availability for Saturday night, however. The Rosen Centre Hotel is our host hotel. Reservations must be made using the hotel’s reservation department by calling (800) 204-7234. Please refer to the rate code “Florida Association of Insurance and Financial Advisors- Annual Conference to receive our group rate of $149. 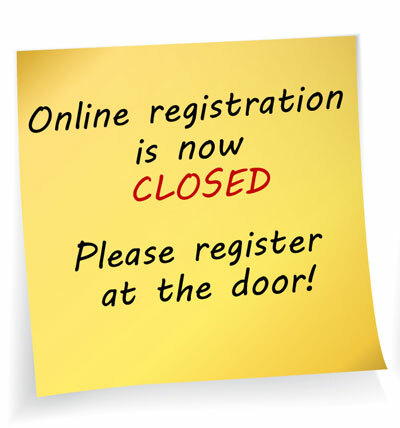 Do not delay making your room reservations; we expect our room block to sell out very quickly. All reservations must be made prior to May 15, 2017. 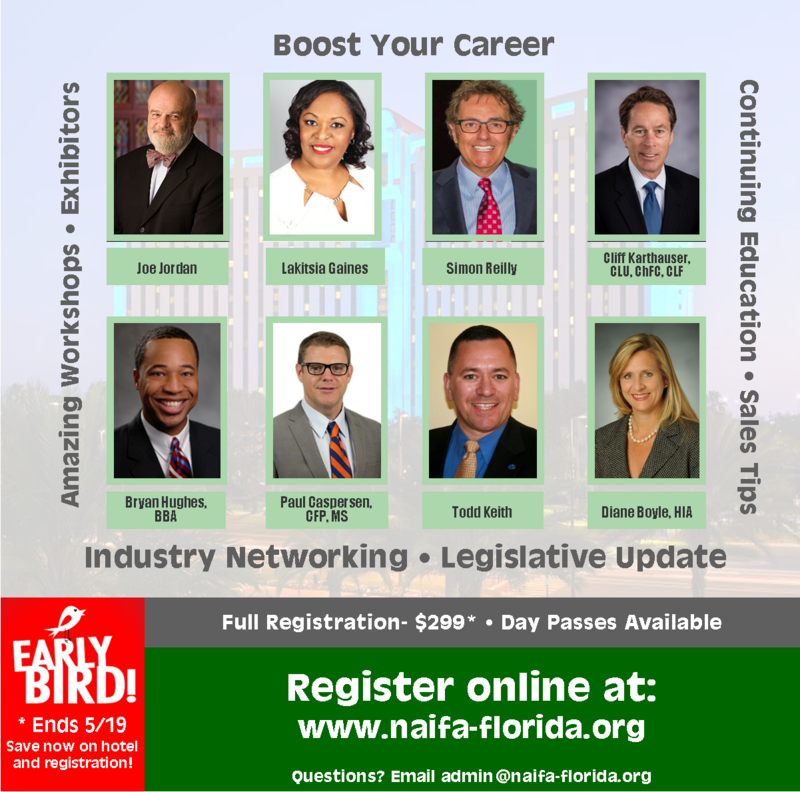 The NAIFA-Florida Education Foundation is offering twenty $100 scholarships for first time attendees to the NAIFA-Florida Financial Advisors Sales Symposium & Annual Conference. Scholarships can be applied to either a full registration or day pass. Scholarships recipients must be NAIFA-Florida members at the time of registration and conference. Recipients must attend the conference and agree to a 30 second video sharing their experience. Scholarships will be awarded after the event. For more information on the Education Foundation, please visit www.nfef.org.